Accordingly, the recent sanctions against North Korea by the U.S. Department of the Treasury are welcome indeed. Following the release of the U.S. Department of State’s most recent Human Rights Report, the U.S. Department of the Treasury ’s Office of Foreign Assets Control initiated sanctions against 11 personnel (all KWP members even though not all of them work in Party posts) and five organizations, including the KWP Organization and Guidance Department (OGD), the Ministry of Public Security (national police) and its prison bureau, and the Ministry of State Security (also known as the State Security Department or SSD) and its prison bureau. The most significant sanction was against the ruler of the regime himself, Kim Jong-un.,  Such actions are the best way to ensure the international community’s efforts will be most effective along with the physical sanctions. Amanda Mortwedt Oh of the Committee for Human Rights in North Korea recently did a superb job detailing how the North Korean human rights situation has proceeded under Kim Jong-un: the suppression continues—if it has not increased—and the international community is taking more actions, such as the U.S. sanctions mentioned above. Those concerned with this issue would do well to read it. As expected, the regime’s reaction was vitriolic and threatening. Han Song-ryol, Director-General of the U.S. Affairs Department at North Korea's Foreign Ministry, insisted that "the United States has crossed the red line in our showdown," and "we regard this thrice-cursed crime as a declaration of war." However, the 7th Party Congress was all about Kim Jong-un. 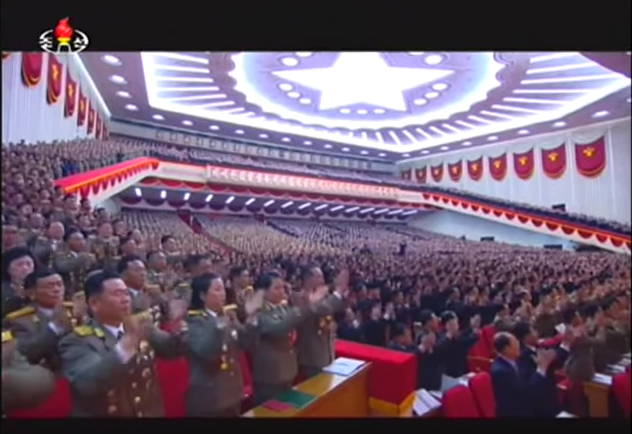 The strategy that Kim and his subordinates employed was to control the attendance at the Congress and thus, the participation in voting—not to mention the requisite cheering and clapping in response to Kim’s speeches. This control would eliminate any opposition from the beginning. The reorganization and re-staffing were, by specific design, to strengthen Kim Jong-un’s leadership at the top of the regime. To ensure the success of these moves, the KWP OGD (one of the organizations sanctioned by the U.S.) and its sub-elements—provincial, city, and county levels under each local Party committee’s organization secretary—politically vetted each and every delegate to ensure that only the most loyal Party members participated in the 7th Party Congress and its delegate selection process. Every one of these individuals is from the core of the Party elite and has profited enormously from their loyalty to the regime, and from service to the Party and its policies, including human rights denial. Kim Jong-un’s consolidation of authority goes even further. According to South Korea’s Ministry of Unification, 129 (54.9%) of the Central Committee's 235 members and candidate members were replaced during the 7th Party Congress, implying that Kim has placed a new set of supporters in the regime’s core positions. If any of those newly appointed personnel had any thoughts of recommending changes to the regime’s policy of human rights denial, they would not have even been considered for appointment to the regime’s core political group. This was undoubtedly one of the reasons why the KWP OGD vetted every attendee. The major shifts in organization and personnel indicate that Kim Jong-un has no intention of improving human rights for any North Koreans, ordinary citizens and select elites alike. By the time the 7th Party Congress was held in May 2016, the KWP membership stood at 3,467,000 or 13% of the population, including 200,000 candidate members. A total of 1,387 members, including 315 women, participated in the Congress at the April 25th Cultural Hall and there were 200 speakers led by Kim Jong-un, SPA Presidium leader Kim Yong-nam, and GPB Director Hwang Pyong-so. Participating in one form or another at the Congress were 1,545 political workers; 719 military personnel; 423 state administrators; 52 workers’ organizational representatives; and 112 scientists, health specialists, culture and arts representatives, and publishing personnel. One representative for every 1,000 Party members participated in the 7th Party Congress. Following the 7th Party Congress, Kim Jong-un redoubled his moves to solidify his hold on power at the 4th Session of the 13th SPA. Changes were made to the state constitution, but there were no changes that improved the human rights situation for the North Korean people. The primary change to the state’s constitution was that of Kim Jong-un’s official title becoming “Supreme Leader.” In doing so, Kim has guaranteed that there will be no changes to the regime’s policy of human rights denial because the concept of Supreme Leader is based on North Korean ideology, and is perpetuated and implemented through observance at every level of society for every North Korean through the Ten Great Principles of Monolithic Ideology. This doctrine, which serves as the North’s true constitution, obligates all citizens to sacrifice themselves in every aspect for the Supreme Leader, eliminating human rights as a consideration. Indeed, if there was ever an opportunity to change policy on human rights in North Korea, it would have been at a time when changes were made to the constitution. But that opportunity was surely missed, or likely never considered. Regrettably, there were no judges, lawyers, or prosecutors appointed to any positions in the new leadership structures either at the 7th Party Congress or the 4th Session of the 13th SPA. 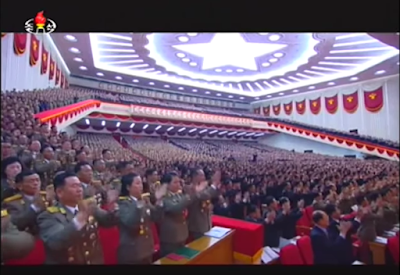 There were no human rights observers, pro-Pyongyang or otherwise, invited to either meeting. Furthermore, it should be noted that all policy change proposals must be processed through the KWP OGD. The tight control exhibited by the OGD during the 7th Party Congress indicates that there was no intent whatsoever to initiate changes. When will the human rights situation in North Korea improve? Certainly, based on evidence and precedent accumulated over the past four and a half years, improvement would be difficult during the reign of Kim Jong-un. Unfortunately, the regime’s policy of human rights denial is likely to get worse before it gets better. Michael Madden, “Deciphering the 7th Party Congress: A Teaser for Greater Change?” 38 North.org, May 20, 2016. URL: http://38north.org/2016/05/mmadden052016/. Kim Sooyeon, “N. Korea's party adopts decision on nukes at key congress,” Yonhap News, May 9, 2016. URL: http://english.yonhapnews.co.kr/northkorea/2016/05/09/56/0401000000AEN20160509001200315F.html. Lee Jung-Hoon and Joe Phillips, “Drawing the Line: Combating Atrocities in North Korea,” Washington Quarterly, 39:2, pp. 61–77. URL: https://twq.elliott.gwu.edu/sites/twq.elliott.gwu.edu/files/downloads/TWQ_Summer2016_Lee-Phillips.pdf. “Report on Human Rights Abuses and Censorship in North Korea,” U.S. Department of State, Bureau of Democracy, Human Rights and Labor, July 6, 2016. URL: http://www.state.gov/j/drl/rls/259366.htm. “Treasury Sanctions North Korean Senior Officials and Entities Associated with Human Rights Abuses,” U.S. Department of the Treasury Press Center, July 6, 2016. URL: https://www.treasury.gov/press-center/press-releases/Pages/jl0506.aspx. Amada Mortwedt Oh, “The Human Rights Factor: Changes Under Kim Jong-un,” HRNK Insider, August 15, 2106. URL: http://www.hrnkinsider.org/2016/08/the-human-rights-factor-changes-under.html. Eric Talmadge, “5 Points from AP Interview with N. Korean Diplomat,” New York Times via Associated Press, July 29, 2016. URL: http://www.nytimes.com/aponline/2016/07/29/world/asia/ap-as-nkorea-tensions-5-things.html?_r=0. Michael Madden, “Conferences Held to Elect Delegates to 7th Party Congress and Provincial Party Meetings,” North Korea Leadership Watch, April 16, 2016. URL: https://nkleadershipwatch.wordpress.com/2016/04/16/conferences-held-to-elect-delegates-to-7th-party-congress-and-provincial-party-meetings/. Cho Jong-hun, “양복입은 김정은 전체인구 약13%가 당원 (Kim Jong-un in Western Suit: 13% of the Population are Party Members),” Tongil News, May 7, 2016. URL: http://www.tongilnews.com/news/articleView.html?idxno=116535. “Recent N. Korean congress replaces over half of party’s central committee,” Yonhap News Agency, May 13, 2016. URL: http://english.yonhapnews.co.kr/news/2016/05/13/0200000000AEN20160513008000315.html. In comparison, the Chinese Communist Party membership makes up about 6% of the population. April 25, 1932 is the day that North Korea celebrates the establishment of the KPA with respect to the beginning of Kim Il-sung and the anti-Japanese partisans’ efforts against Japan’s colonial government in Korea. The KPA Foundation day was formerly February 8th and the hall was named the February 8th Cultural Hall at its founding in October 1975. The hall property covers 124,000 square meters. The seven-story hall itself is about 80,000 square meters and houses a 6,000-seat viewing hall, a 1,100-seat theater, and a 600-seat movie theater. The 6th Party Congress of October 1980 was also held there. Cho Jong-hun, “양복입은 김정은 전체인구 약13%가 당원 (Kim Jong-un in Western Suit…13% of the Population are Party Members),” Tongil News, May 7, 2016. URL: http://www.tongilnews.com/news/articleView.html?idxno=116535. Hyun Seong-il, 북한의 국가전략과 파워 엘리트: 간부정책을 중심으로 (North Korea’s National Security Strategy and Power Elite: Focus on Cadre Policy) (Seoul: Sonin Publishing, 2007), p.400-403.